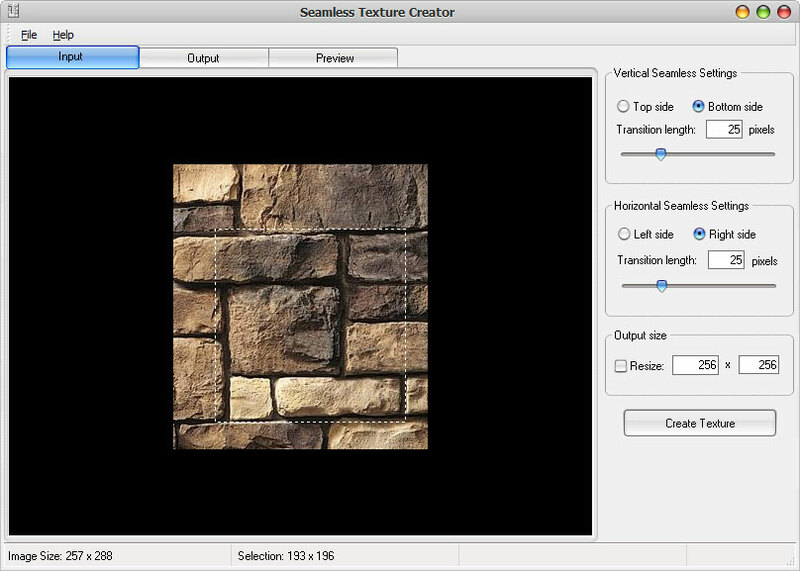 Seamless Texture Creator is a easy-to-use tool for creating seamless-tileable textures from existing images. Normally you don't have to change any settings, Seamless Texture Creator will automatically create the seamless texture with just a single click! Seamless Texture Creator supports following input formats: Bitmaps (*.bmp, *.dib, *.rle, *.wbmp), GIF images (*.gif), JPEG images (*.jpg, *.jpeg), Kodak Photo-CD (*.pcd), Metafiles (*.emf, *.wmf), Portable network graphics (*.png), Targa images (*.tga, *.targa), TIF images (*.tif, *.tiff), ZSoft Paintbrush (*.pcx). And it supports 7 output formats: JPG, PNG, GIF, BMP, TIF, TGA, EMF. Seamless Texture Creator will save you hours of work! And since now you don't have to buy seamless textures because you may use this software to make them by yourself within seconds!